I’m getting back into my knitting groove, but it’s slow going. I’m still not feeling the same constant urge to knit that I used to feel; I’m willing to read or play games on my phone or just watch TV. But at least the knitting is coming back to me. It helps when I finish something and really like it. Like yesterday, when I made another Vermonter. I seriously love this pattern. It uses super bulky yarn so it works up so darn quickly. I started it yesterday morning, worked on it on and off throughout the day, and finished it in the afternoon. This time I used the recommended needle size. I haven’t tried it on yet because it’s just so cute before it gets stretched. Since that was done, I decided I’d work on another hat I’d started the other day. 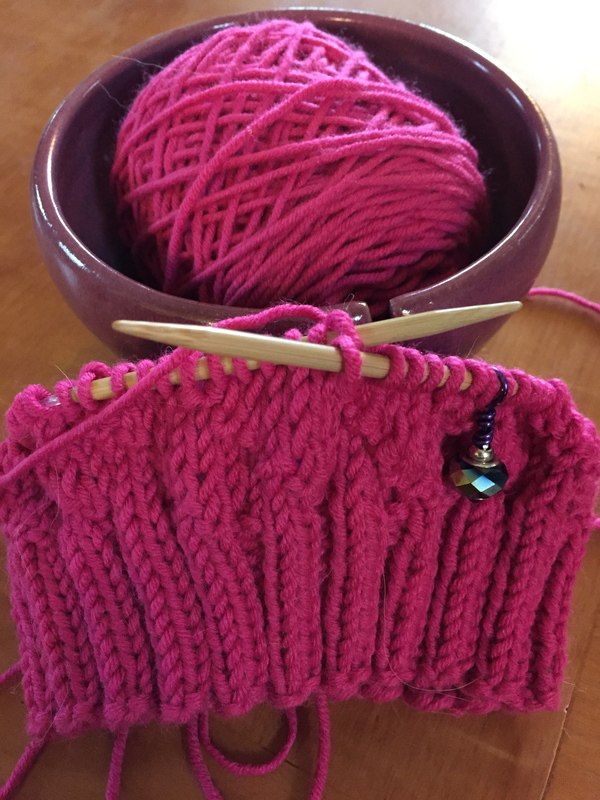 This is the hot pink Simpliworsted and it’s going to be another Swirl hat, like the TARDIS blue one I made. (And if you go in to look at that pattern, you might notice that three of the photos on her project page…yeah, they’re mine. So happy!) 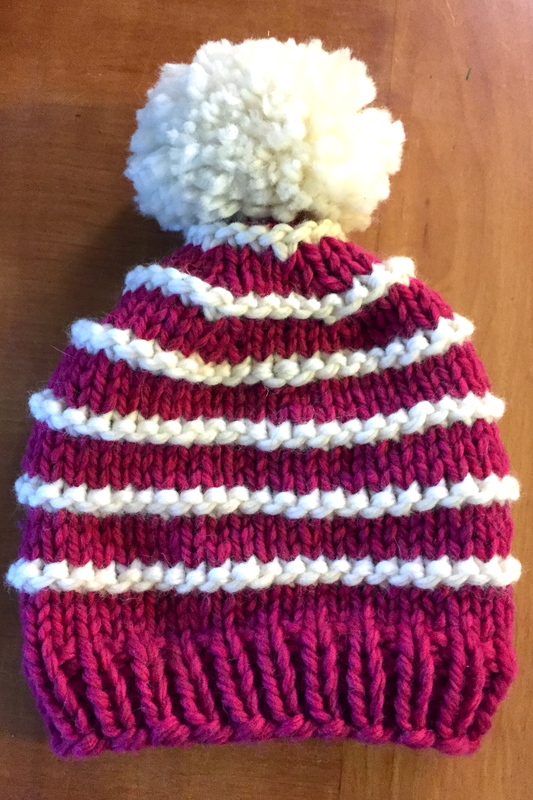 Since it’s for me, I used smaller needles to make a slightly smaller hat. It’s going more slowly than the Vermonter but I still love the yarn and the color. The most encouraging sign of recovery, though, is that I’ve got ideas swirling around in my brain again. I want to make another Vermonter, maybe two, with different color combinations. I want to get back to the bag I was making with recycled silk yarn, though I am a little irritated with felting right now. I started felting the peach/green clutch and it’s not going well. I kind of hate my washer for that reason. But the bag has already shrunk shorter than I wanted it to be, and it still has way too much stitch definition. I think I’m going to take it to my sister’s house and borrow her washer, since it has a center agitator and that seems to make a huge difference. It’s so frustrating, because I love felting. I love seeing something go from a huge, floppy mess to a neat, tidy FO. I need to find a reliable felting process. I’ve tried it in the sink with a wooden spoon, but maybe I need to buy a clean bucket and new plunger and try that. If my sister’s washer fails, that’ll be my next step. We’re expecting snow this weekend, maybe 4-5 inches, so I’m expecting to have plenty of knitting time. Might be a great time to cast on some fun new projects! What are you working on this weekend? Exactly. How do I make it stop?